Meanwhile, in great secrecy and after much dissention and debate, Hanoi made the momentous decision to switch from a protracted guerilla war to more conventional big unit, maximum effort offensive operations. This tactic would “kill more enemy soldiers” and “enable our units … to continue their preparations” for an eventual country-wide assault which would in turn lead to a spontaneous uprising by the oppressed South Vietnamese and a decisive battlefield victory over the imperialist aggressors. To this end, the North Vietnamese were prepared to incur even higher losses in exchange for a corresponding increase in the number of American caskets shipped home each week. This, by the politburo’s calculus, would force the U.S., now focused on the 1968 elections and with anti-war sentiment steadily growing, to withdraw from Vietnam. A key feature of the enemy's revised strategy would be to draw American units deep into jungle killing zones—a scenario for which the terrain in the Central Highlands was eminently suited. This tactic was not entirely new, but now the enemy would be inclined to strike harder and stay longer. On the allied side, monsoon weather restricted the aerial operations upon which so much depended, and triple canopy jungle made even spotting of artillery fire difficult. American units were further handicapped by the loss of experienced officers and NCOs as their one-year tours came to an end. Line replacements were likewise green, with little or no combat experience. Not far away, another major engagement occurred on 23 July. This time the weather was better and although 18 Americans were killed in a five-hour firefight, the enemy lost ten times that number, many of them victims of extremely efficient artillery and air strikes. The next two-and-a-half months brought frequent but mostly minor enemy contact. When FRANCIS MARION ended on 11 October, EC-47 crews had flown 221 missions totaling 884 flying hours in direct support of the operation. Unfortunately, unit histories provide no further details as to results or how the intelligence was used. However, USAF statistics show that 312 ARC LIGHT sorties—dropping 6,552 tons of bombs—were flown in support of the operation. A fair proportion of these strikes were likely targeted based on ARDF fixes. To the north-northwest of FRANCIS MARION, in Kontum Province, the 173d Airborne Brigade continued Operation GREELEY, which had already become a bloody affair. In early July “allied signal intelligence,” again almost certainly ARDF, located an enemy regimental headquarters some twenty miles southwest of Dak To. On 10 July the lead elements of a battalion moving within a few kilometers of the presumed fix location encountered heavy automatic weapons fire. The customary artillery support was called for as the troopers regrouped in the midst of continued machine gun and small arms fire. When the smoke cleared, 22 Americans lay dead, another 62 wounded. The enemy slipped away, leaving behind nine bodies. The site had obviously been an enemy complex of some importance, the exact nature of which was apparently never determined. 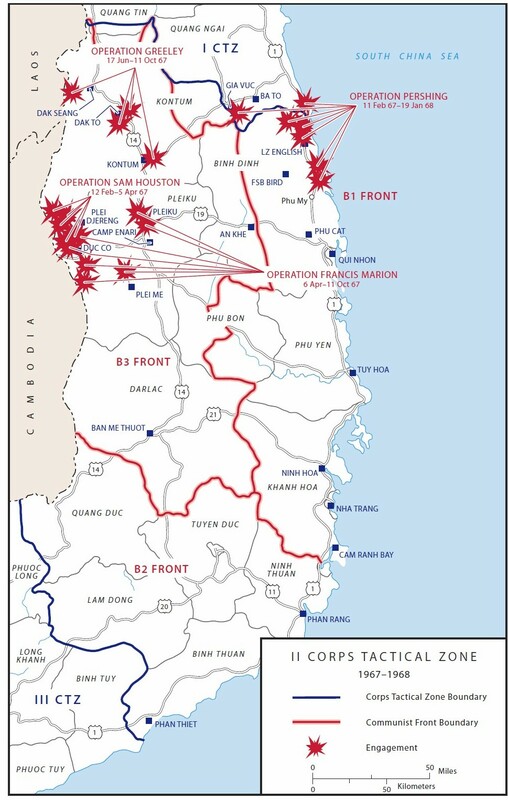 Ground action was intermittent thereafter, although in early August an ARVN force fought a running four-day battle against a suspected battalion of the 174th NVA Regiment. The ARVN troops uncovered a regimental-size command post within which was an elaborate mock-up of the Dak Seang Special Forces camp. The South Vietnamese had evidently spoiled an attempt to overrun the camp. Meanwhile, attacks by fire against both base camps and allied units in the field increased in frequency and intensity. Appearing for the first time were 122mm rockets and 120mm mortars, not previously seen in this area of operations. Allied patrols continued to tromp through the jungle, occasionally finding evidence of recent enemy presence, but without significant contact. On 11 October, Operation GREELEY was officially terminated. 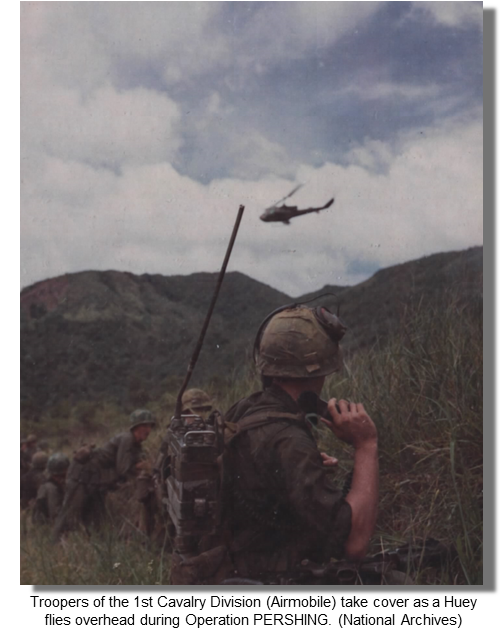 Electric Goon crews had logged 864 hours spread over 216 missions in support of the 173d Airborne Brigade, which acknowledged that “Airborne Radio Direction Finding continued to be the single most important COMINT product provided to the Tactical Commander. During Operation GREELY [sic], a total of 135 fixes were of immediate interest to the supported command.” On 12 October FRANCIS MARION and GREELEY were consolidated into Operation MACARTHUR under the overall command of the 4th Infantry Division, with other units temporarily attached. Meanwhile, Over on the Coast . . . In contrast to the highland jungles, where only Mother Nature and the NVA were of much concern, the coastal regions were home to a sizeable chunk of South Vietnam’s population, whose “hearts and minds” had to be taken into consideration. The region had never leaned towards the Saigon government to begin with, which made the never-ending task of pacification doubly difficult. 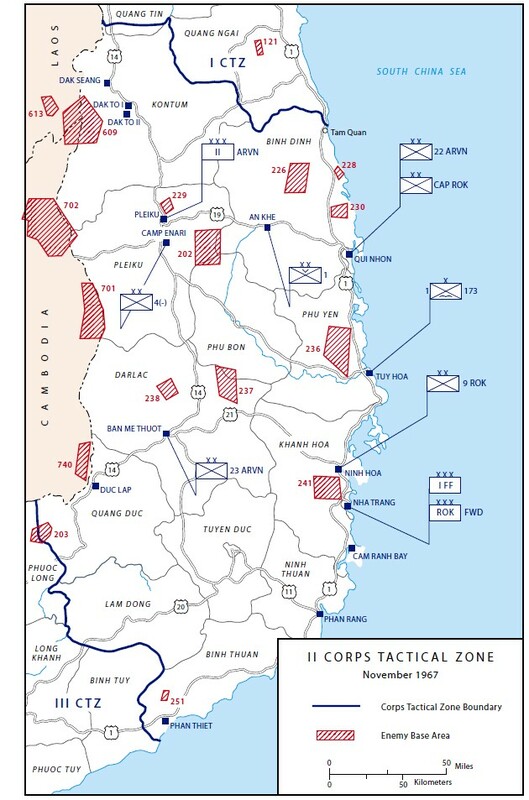 Too, the shuffling of combat units in and out of Pleiku and Kontum left I Field Force short-handed along the coast. Nonetheless, the 1st Cav, or such elements of it that were available at any given time, pressed on with Operation PERSHING in Binh Dinh Province near the boundary with I CTZ. By October, the division claimed to have killed almost 4,000 enemy at the cost of 498 cavalry troopers killed and 2,361 wounded. In August-September, down the coast near Tuy Hoa, the 95th NVA Regiment caused somewhat of an upheaval. Security of this area was the nominal responsibility of two of the Republic of Korea (ROK) divisions in country. The Koreans, while “allied” with the U.S., were not subject to direct MACV control and in fact ran their war in their own way, which was often not in sync with the “go get ‘em” offensive mindset of American commanders. The ROKs (“Rocks”) went about their business in a methodical, almost plodding manner, but their results were generally good. In a sweep of the 95th NVA’s base area, the Koreans claimed to have eliminated over 700 of the enemy at a cost of only 27 of their own. But in late August the 95th occupied hamlets on the outskirts of Tuy Hoa city, uncomfortably close to the nearby airbase. Mindful of collateral damage the ROKs and South Vietnamese took a week to eject the invaders, incurring serious losses in the process. Three weeks later the NVA struck again. This time the Koreans, leery of taking more casualties, called in artillery and airstrikes, blasting friend and foe alike. Nine hamlets and some 3,700 dwellings were left in smoking ruins. The NVA departed, but the damage to the allied pacification effort was incalculable. The perceived threat to Tuy Hoa airbase caused near panic at I FFV. Two battalions were recalled from the highlands, later reinforced by another from the 1st Cav, to clear the area west of the base. Results were negligible but the operation (BOLLING) would continue into the New Year. By the end of the year, 212 EC-47 sorties (848 hours) would be flown in support of Operation PERSHING, but again results are unknown. Seventeen missions (68 hours) would be devoted to the late-starting BOLLING operation. Another 10 sorties supported the low intensity, long duration Operation BYRD. In supporting these operations, 361st TEWS/6994th Det.1 personnel at Nha Trang found a bit of personal interest and involvement. Beginning in July, crews had fixed targets in the local area while on the way to or from their fragged areas. None of these nets could be immediately identified, and ASA’s 313th Radio Research Battalion, the SIGINT Collection Management Authority for the region, seemed to take little interest. Undeterred (and maybe a little annoyed) Det. 1 analysts took matters into their own hands, compiling and collating callsigns, frequencies, and fix data which was forwarded to 313th. The very next day (22 October) Nha Trang was hit with mortar rounds. Army interest piqued immediately. Hearability being better at the Det. 1 compound ASA accepted the invitation to set up shop there, although no intercept operators could be spared to man the position. Det. 1 volunteers stepped in and in short order the previously unidentified nets were properly cataloged. The 403d SOD, also located at Nha Trang in support of 5th Special Forces, took over as a local DSU. As 1967 wound to a close, focus turned again to the Central Highlands as intelligence indicated an enemy build-up around the outpost of Dak To, in northern Kontum Province. The ensuing Dak To battles would be the most brutal American forces had yet seen. It would also provide one of the better records of EC-47 support of a ground operation.